Three Chinese Coast Guard ships encroached into waters right near the Japanese-controlled Senkaku Islands yesterday, reports CNN. 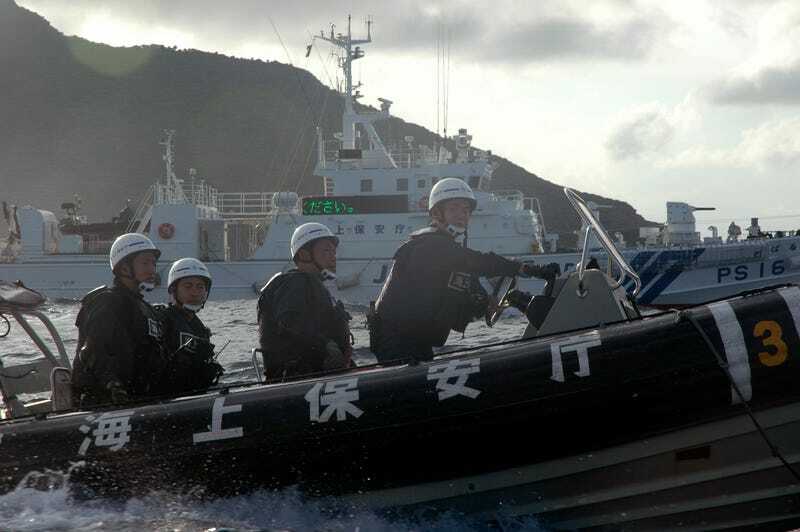 The Japanese Coast Guard says yesterday’s incursion is China’s fourth this year, which puts everyone right on pace to match 2016, in which 36 incidents took place. Monday’s maritime jostle was just one of many face offs between the two regional powers over the chain of islands China claims are its territory. Most media attention has focused on China’s activities in the South China Sea, but the Senkaku Islands are arguably more contentious because the United States may or may not be forced to protect them under the U.S.-Japan Security Treaty, depending on who may or may not be the American President at any particular moment. U.S. Secretary of Defense James Mattis said that Article 5 of the treaty, which allows for the use of military force, covers the islands, during a press conference with Japanese Defense Minister Tomomi Inada on Saturday. Mattis’ words are consistent with former president Barack Obama’s commitment to Article 5 during his visit to Japan in 2014. The Japan Times reported in December that Tokyo will spend 27 percent of its Coast Guard budget to increase patrols around the Senkaku Island—which are also disputed by Taiwan—in response to China’s moves. The Senkaku Islands—also known as the Diaoyu Islands in China or the Diaoyutai Islands in Taiwan—are a disputed little slice of the Pacific Ocean. Not much more than a couple of uninhabited rocks, they were mostly used as navigational markers in the past. Annexed by Japan in 1895, they were controlled by the United States after World War II, until the U.S. withdrew in the early 1970s. Complicating matters further, both China and Taiwan agree that the islands are part of Taiwan, though neither of them agree on what “Taiwan” is exactly. The Senkaku Islands are that little white dot surrounded by the black dot just Northeast of Taiwan. How does the Trump administration view what’s going on? Secretary of State Rex Tillerson said during his confirmation hearing last month that the U.S. may bar China from accessing its own artificially-build islands. And top White House aide Steve Bannon has long predicted a war between the U.S. and China, as we previously reported. Any sober-minded politician, they clearly recognize that there cannot be conflict between China and the United States because both will lose, and both sides cannot afford that. For example, an international tribunal in the Hague ruled last summer that China built an artificial island that was inside of Philippine waters. Beijing, which did not participate in the proceedings, said it would not honor the ruling. The U.S. has a defense pact with the Philippines, too. So much for that. Instead of the Trump administration ratcheting up calls for an armed conflict, which would benefit no one, one option might be for the U.S. to start sanctioning Beijing for its actions. The sanctions listed above would be a significant first step in challenging China over its maritime incursions, and would certainly get Beijing’s attention. Any actions against China should be measured and have a specific purpose, as were Obama’s sanctions against the Kremlin over its annexation of Crimea and support of rebels in eastern Ukraine. The U.S. retaliatory response to a Chinese action should be discrete, meaning a single, independent action that can be unilaterally or multilaterally carried out at will. A clear example was the sending of two B-52s to contest China’s announcement of an air defense identification zone over the East China Sea in 2013. It should be targeted instead of indiscriminate. This is important because it limits the risk of large-scale Chinese retaliations. At the same time, ensuring that U.S. actions are only aimed at those actively and directly engaged seeking to change the status quo in the South China Sea bolsters the legitimacy of the U.S. response. For instance, instead of imposing sweeping economic sanctions on China, the United States should respond to China’s land reclamation by sanctioning companies involved in the process, such as the China Communications Construction Company Dredging firm. The response should also be proportionate, in that its intensity should roughly match that of the Chinese act. This limits the risk of escalatory response while allowing the costs that China would have to suffer to vary according to its own actions. And lastly, U.S response should be carried out immediately after a Chinese escalatory action to show that there is a cost to every misbehavior, as well as to negate any potential benefits that China could reap from its action. For instance, if China deploys surface to air missiles on its features in the Spratlys, the United States should help Vietnam and the Philippines acquire assets specifically designed to counteract those Chinese capabilities. To stop China from continuing to change the status quo in the South China Sea and militarize the dispute, the United States must be able to deter effectively. And ultimately, the greatest value of flexible response lies in its ability to send an unambiguous deterrence signal to China. As long as U.S. responses rely on actions with a primary purpose other than deterrence, such as joint exercises and freedom of navigation operations, it is not able to send a message of resolve to China because it suggests Washington is not ready to bear the costs of directly confronting China’s actions. Comparatively, the Trump administration has yet to outline a clear China policy that doesn’t go beyond sound bites. Pontificating about war with China over the airwaves of Breitbart or recklessly calling for a “trade war” with China isn’t policy. It’s bluster. Based on China’s consistent violation of its neighbor’s maritime sovereignty, there are strong arguments for America to honor its defense commitments to its allies in Asia. But it’s very unwise to respond with using the word “war” in any context.